Night on the Galactic Railroad is based on a 1927 manuscript by Kenji Miwazawa which was left incomplete and later finished by followers of his work. The character designs are taken from Masumura Hiroshi's manga renditon of the same work. The story bears great resemblence and is actually the inspiration for Leiji Matsumoto's Galaxy Express 999, though the animated version of Night on the Galactic Railroad came 4 years after GE999. The story revolves around Giovanni, who has lived a rough life. Working to support the family, and not having enough time to play, he is ridiculed by his peers. However, on the night of the Festival of the Stars, after running away from his sneering peers and into the countryside, a strange thing occurs. A train appears out of the night sky...a train from the Galactic Railroad. With his friend Campanella, Giovanni boards this train bound for the edge of the universe. 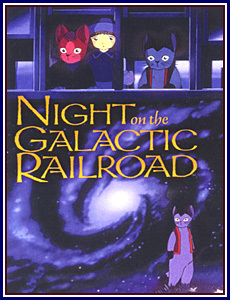 Night on the Galactic Railroad is a very symbolic story which adheres to the symbolism of the novel. There is symbolism in the people on the train, in its path, and in many other things: traits which Matsumoto later kept in mind when he created the three-nine. It also carries religious overtones. As one writer commented, it's more overt than Patlabor 2 but more serious than Evangelion when it comes to religion.